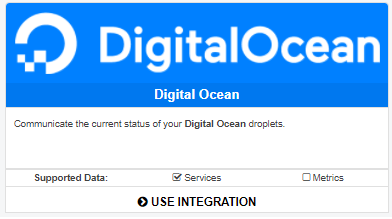 Log in to your DigitalOcean account. Go to the API link in the top menu. Generate a new token for use with the Status Page integration. Copy this token to your clipboard. Click “USE INTEGRATION” and then enter a name for this, and your DO token into the fields shown. To finish up – click “Test & Save” , you can now access service status and metrics from DigitalOcean when modifying your Status Pages.